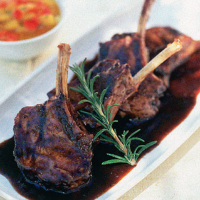 This lamb dish is one of the oldest recorded recipes in South African cuisine. Tamarind was used for medicinal purposes as well as to add acidity to food (until vinegar was introduced). It has a sweet/sour taste and its spices are very evocative of Indonesian cuisine. Put the onions and oil in a wide saucepan or large casserole; scatter over the garlic, allspice, cloves and bay leaves. Arrange the cutlets on top and grind over plenty of black pepper. Mix the tamarind paste with 200ml boiling water and pour over. Add the nutmeg, a pinch of salt and the sugar. Cover the saucepan with a tightly fitting lid and cook over a high heat for 5 minutes. Lower the heat and simmer for 25 minutes until the meat is tender. Add the chopped chillies, seeding them first if you’re not keen on too much heat. To make the salsa, place all the ingredients in a small bowl and mix together. Serve the chops, garnished with rosemary sprigs, with the salsa. The bright flavours of this South African classic demand a wine partner that isn’t too serious. This recipe was first published in Sun Jul 01 01:00:00 BST 2007.